You are looking at a Commemorative Silver Medal for the Naval Battle of Gangut. The Medal was instituted on June 12, 1914 during the reign of Tsar Nicholas II. The Medal was created to commemorate the 200 Year Anniversary of the Naval Battle that took place on July 27, 1714 near Cape Gangut, located in south-western Finland. 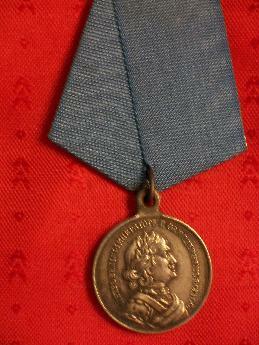 The obverse of the silver medal bears the laureate, cuirassed bust of Tsar Peter I facing right with the circumscription signifying: "Peter the Great Enperor and Autocrat of All Russias". 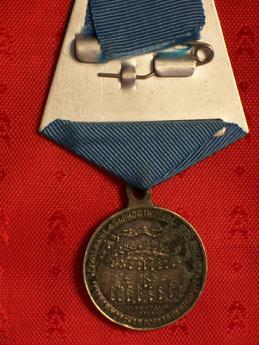 The reverse of the Medal shows the scene of the naval battle with the date: "27 July 1714" below and is surrounded by an upper inscription placed on a scroll meaning: "Dedication and Fidelity Excel Force" and a lower one meaning: "First Naval Victory at Gangut".